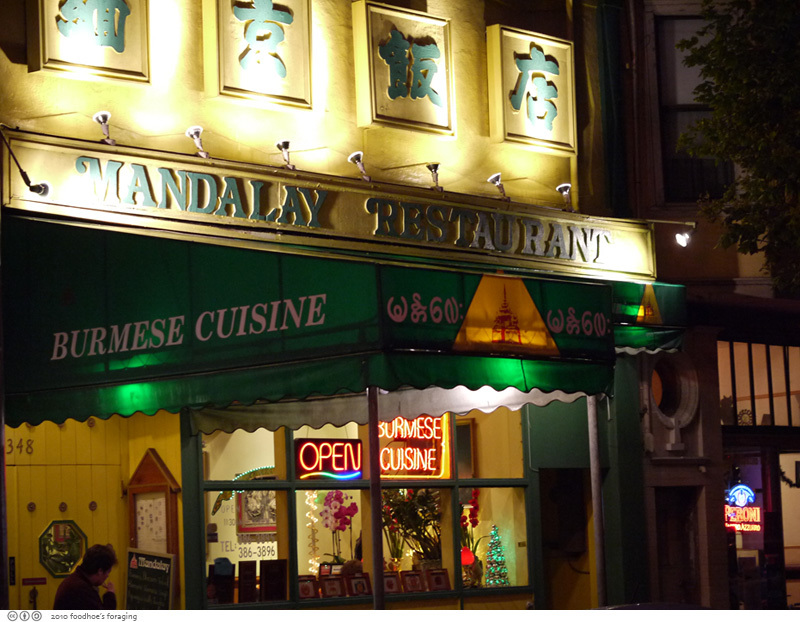 My fine friend JT organized our holiday feast at Mandalay Restaurant in the Inner Richmond, and I was glad to finally check out this establishment that was the first restaurant to serve Burmese cuisine in the City. 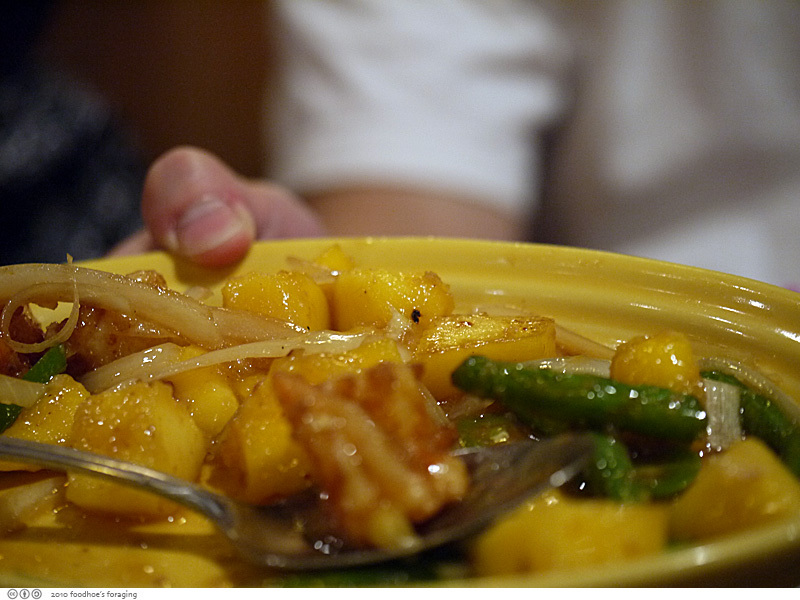 It is often overlooked by the other shining superstar restaurant, but we all agreed that we liked the food and atmosphere of Mandalay Restaurant more. It serves both Burmese and Mandarin cuisine, but we focused on ordering the Burmese dishes, which are influenced by its neighbors, Thailand, China, Laos and India, with its own distinctive set of flavors and preparation. 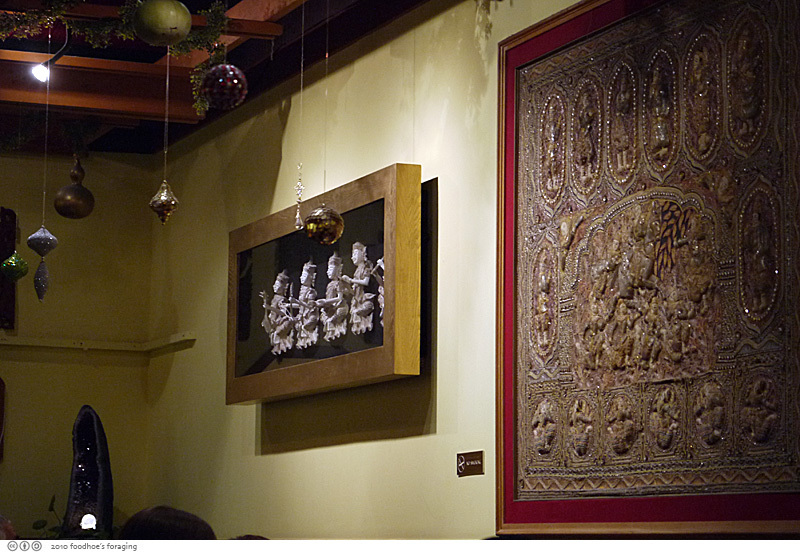 The restaurant was full of lovely traditional artwork and festive holiday decor. 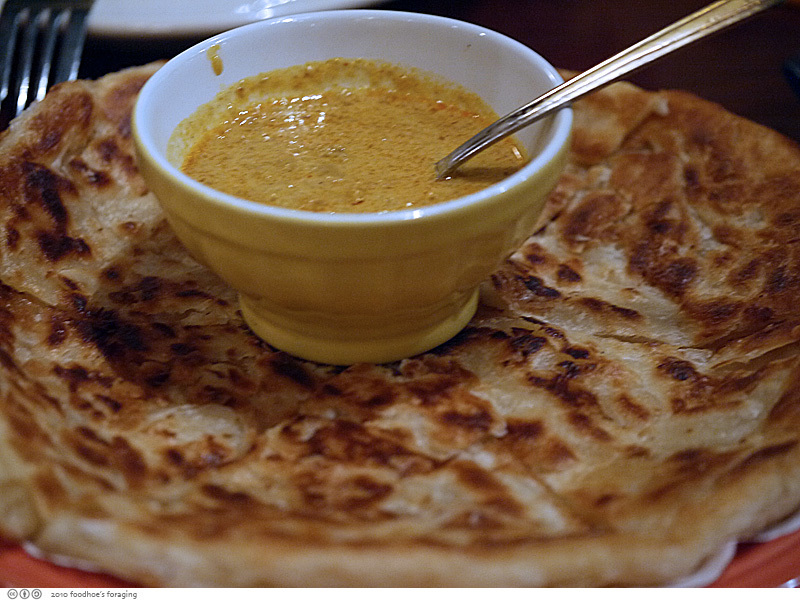 We began with Balada 5.95 are the Burmese equivalent to roti or paratha, a deliciously crispy pancake shaped bread served with a rich coconut milk curry dipping sauce. We gobbled this up! We shared a couple of orders of Samusa ($8.00) elegant triangles filled with a mixture of grounded curried chicken and potatoes, wrapped in a thin layer of pastry and fried to a crisp. 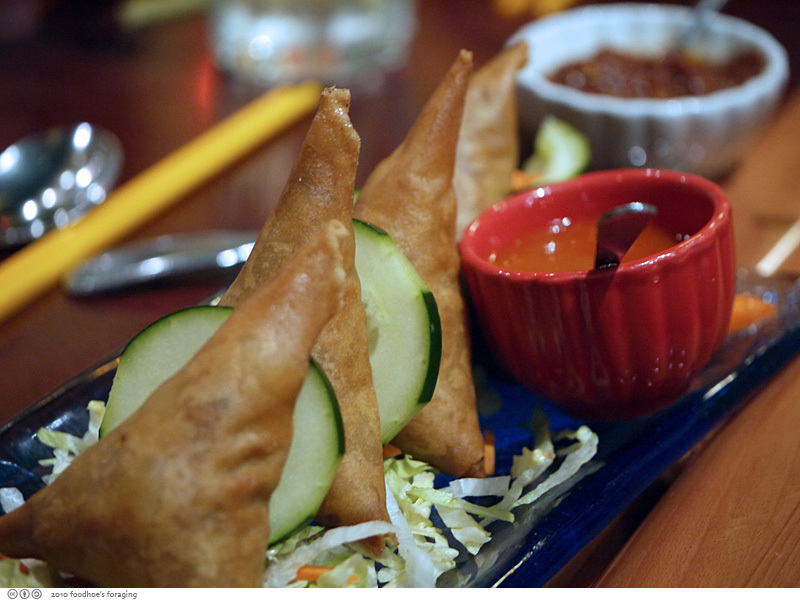 These were served with a sweet and spicy sauce and thin slices of cucumber. JT snuck a cupful of the Samusa Soup 8.50 which our server said is one of their most popular dishes as it is well suited to the American palate. It is a thick bean based soup, spiced with curry leaf, lentils, crunchy yellow beans, cabbage, onion and mint leaf and contains broken pieces of samusa. 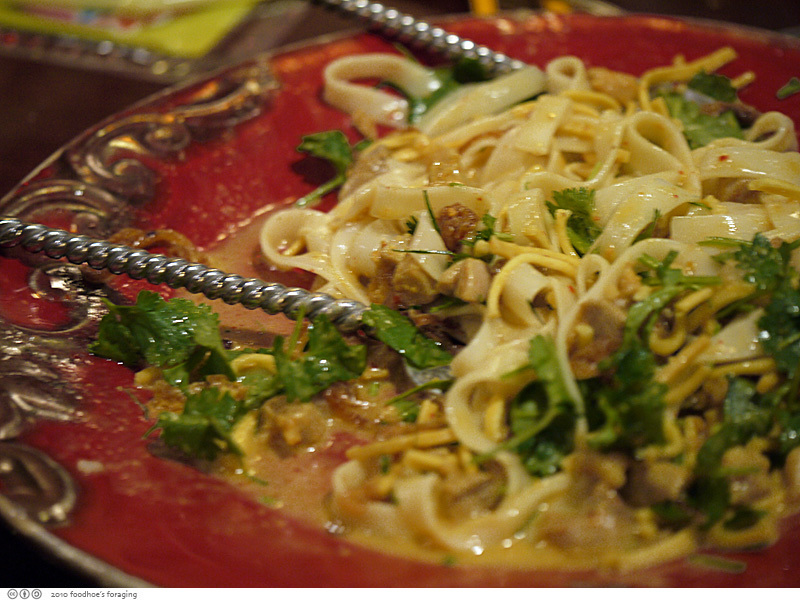 Our server encouraged us to try the Moo Hin Nga ($8.50), a traditional fish chowder made with rice noodles, ground catfish, onions, and cilantro and flavored with lemon grass, ginger and black pepper. 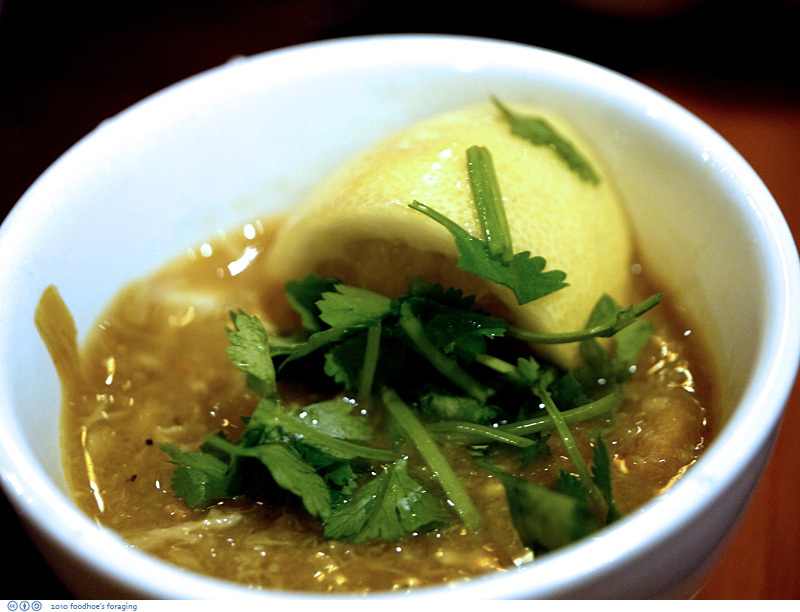 This soup also includes slices of boiled egg, and is accompanied by cilantro and lemon wedge garnishes. It had a lovely texture that was perhaps augmented with boiled rice and was very flavorful, a dish I want to return for more! 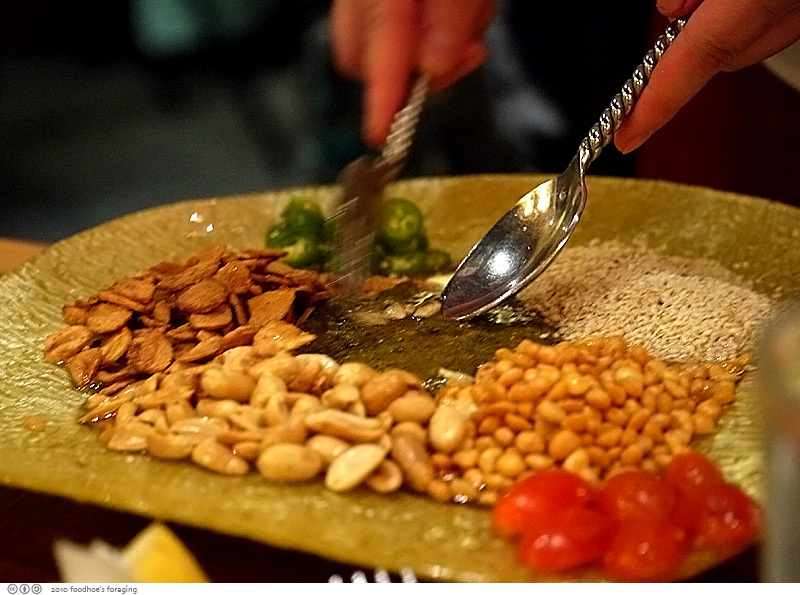 Of course we ordered the famous Burmese Tea Leaf Salad (Lap Pat Dok) 8.50, which is prepared with imported Burmese tea leaves, toasted with lentil seeds, driedshrimps, fried garlic, green pepper, sesame seeds, peanuts & dressing. The salad arrives with the ingredients separated on the plate and are tossed at the table by the server, who first identifies each component to us before mixing it. 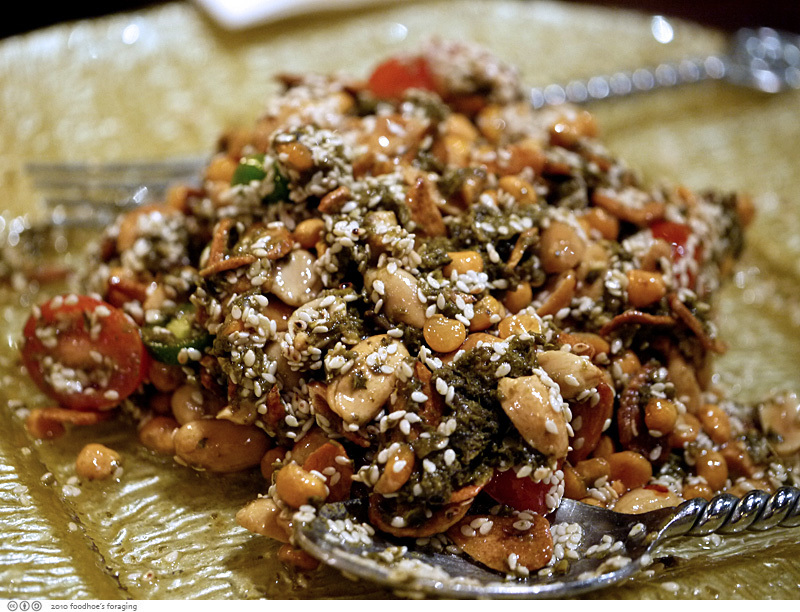 It is a brilliant combination of textures and interesting flavors, crunchy from the toasted nuts, seeds and dried legumes, intense flavor from the fried garlic and shrimp, mixed up with fresh juicy pieces of grape tomato and slices of spicy jalapeno. Then tossed with a squeeze of fresh lemon, some kind of oil and the pungent fermented tea leaves. It is called a salad, but does not have much in the way of fresh vegetables that we expect when ordering salad. Even the superstar has shreds of lettuce in their version, but this is the way it is served here. I love this dish… everyone does, but it is not the kind of salad that I crave a big bowlful for lunch. It is very good shared as part of a meal. 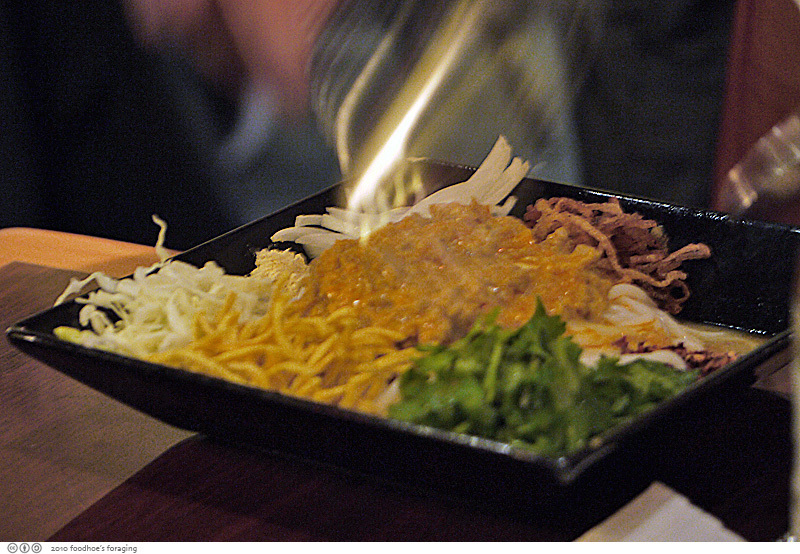 The presentation of the Mandalay Special Noodle dish ($8.95) is very colorful, and is also tossed for customers tableside. 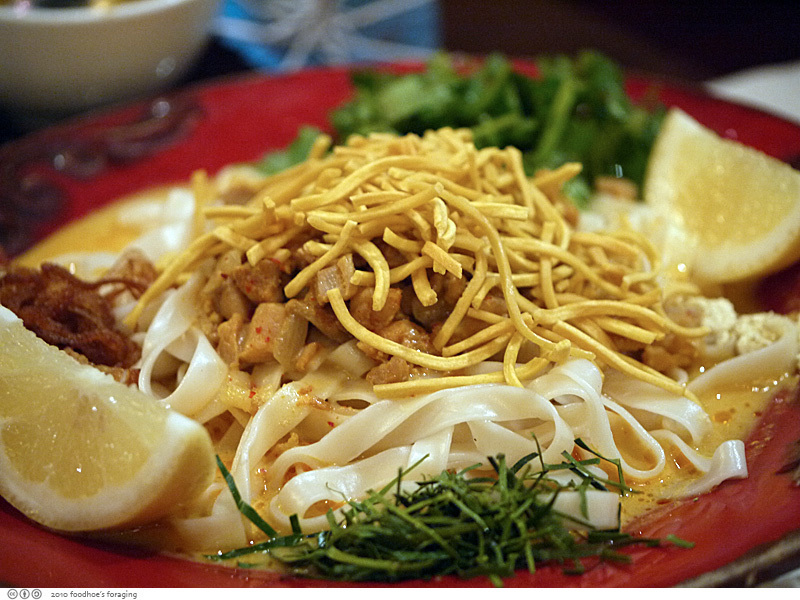 It’s quite different from the salad, at its base is a nest of flat rice noodles, topped with diced coconut chicken, shreds of aromatic kefir lime leaf, yellow bean powder, fried onions, lemon juice, lime juice, basil and cilantro and a handful of fried thin noodles on the top. 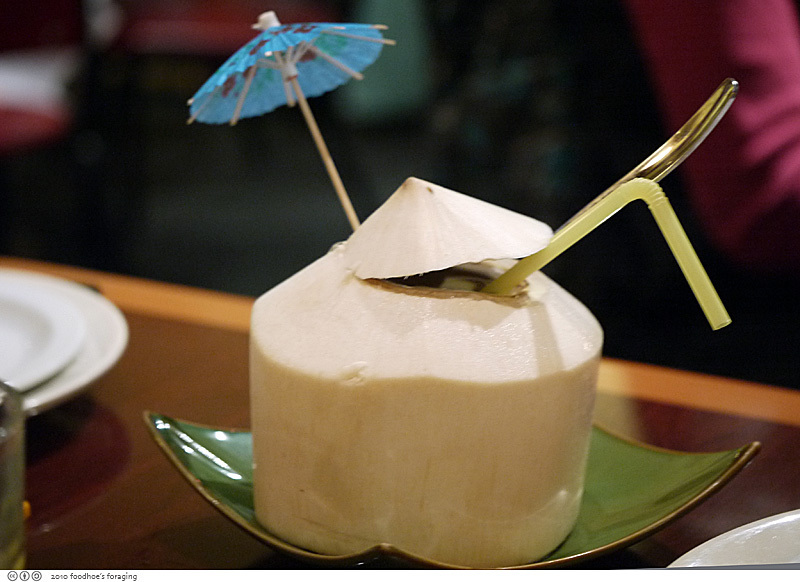 It had an elegantly rich spicy coconut sauce that was well suited to the fragrant ingredients. These first dishes were brilliant and so full of unique flavors and interesting textures. We split another noodle dish, this one was Nan Gyi Dok, Burmese rice noodle with chicken, split yellow pea powder, mung bean sprouts and fried onion and cilantro. The dressing had a bit more fish sauce than the other noodle dish. soft round rice noodles mixed with thin fragile crunchy egg noodles, it was very soothing and comforting. I ordered a bowl of coconut rice just to try it. 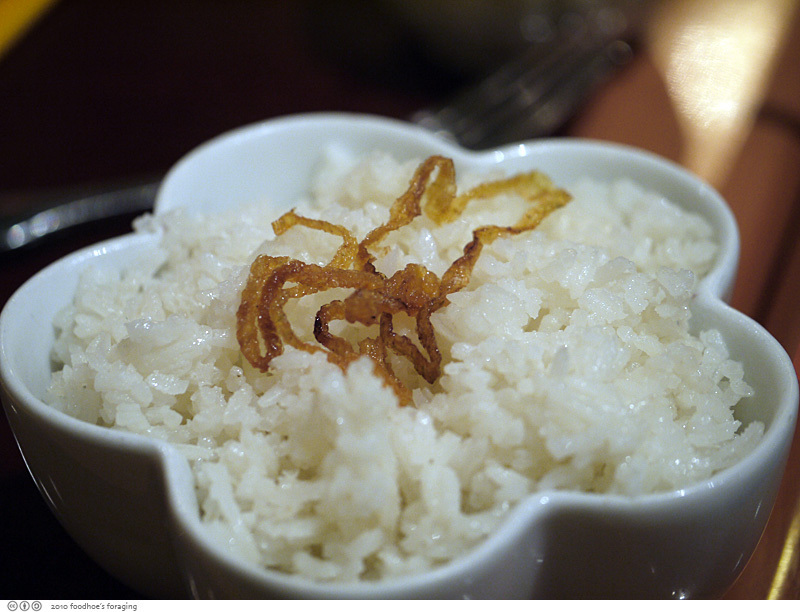 It came in a charming flower shaped bowl topped with a few fried onion tendrils. It smelled wonderful and welcomed any and all spicy sauces. At this point, I was happy to just nibble at the next dishes that began to arrive. 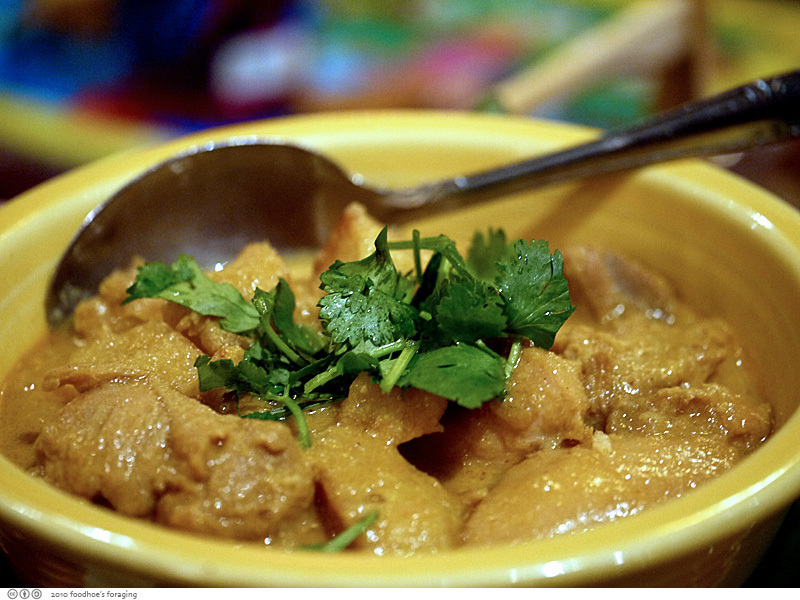 The Burmese Style Curry Chicken (9.25) was a mild yellow curry with potatoes. 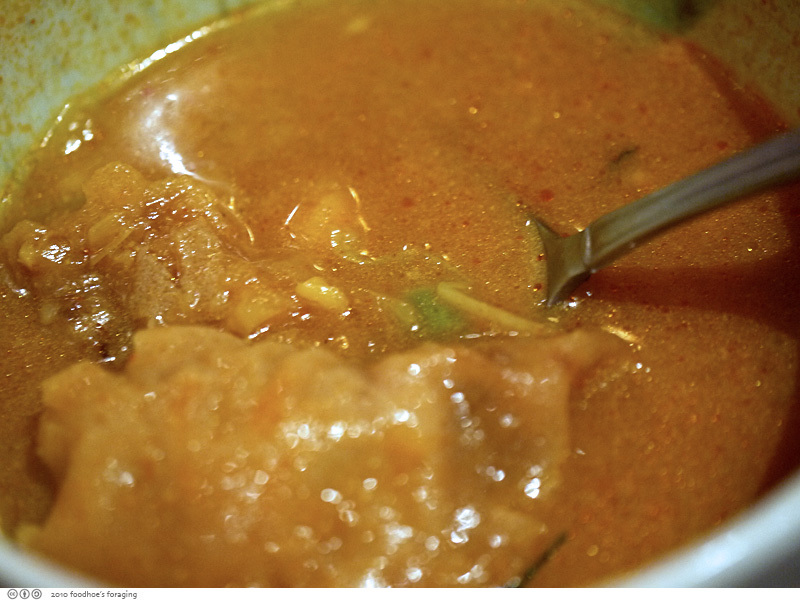 Burmese curries are herb based, rather than spice based and typically are made from garlic, ginger, chili, turmeric and dry shrimp paste. The kids liked this one. 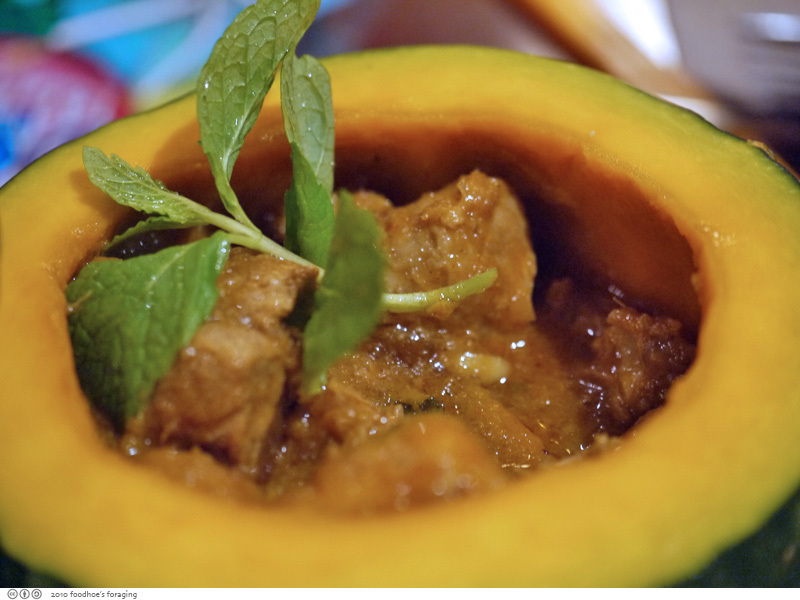 I loved the presentation of the Pumpkin Pork Stew with Sour Mango (9.50). Tender pieces of slow cooked pork and pumpkin filled a carved kabocha squash (not yet cooked). This was rather sweet and had a pungent aroma from a liberal dose of fish sauce. We ordered a non spicy dish for the kids, Mango Prawns (12.00), pan fried prawn with fresh chunks of sweet, tangy mangoes, onion and green beans. This wasn’t my favorite but I was pretty full by this time. 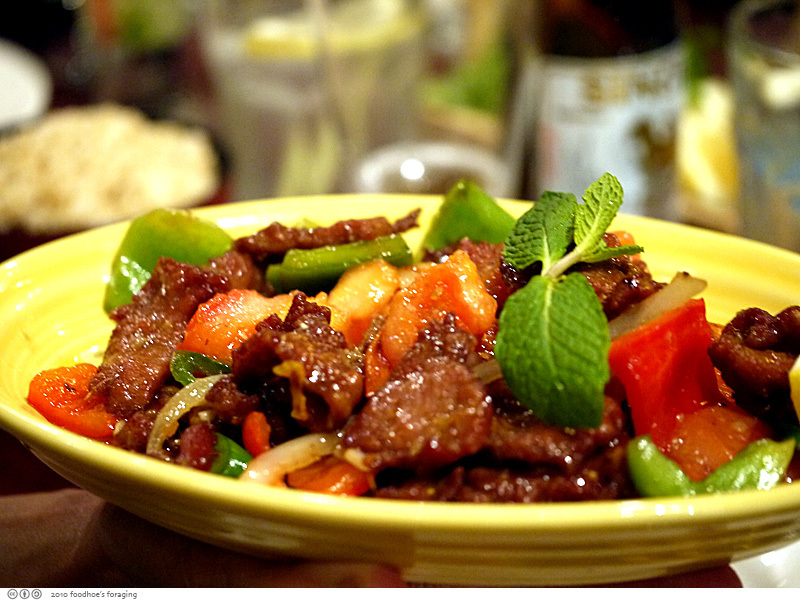 Rangoon Beef (11.50), marinated beef sauteed with tomato, onions and green bell peppers. This dish was most like a typical Chinese stirfry, but with some additional spices but not hot spicy. 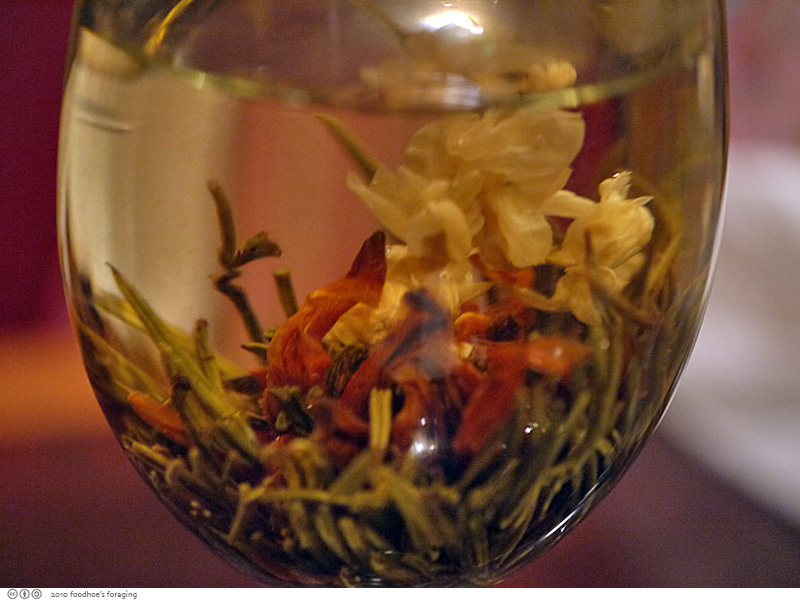 Daisy ordered a flower blossom tea that was served in a winglass which showed the fragrant jasmine flowers to great effect. 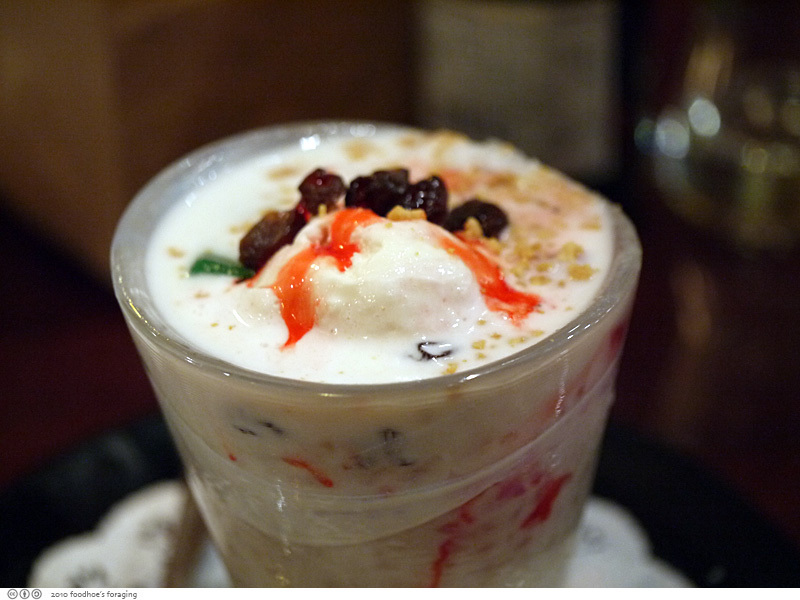 We ordered a Faloodi, or haludi or something like that, it was very sweet and full of unexpected textures. I scooped a few spoonfuls but wasn’t really taken by the experience. We all tried it and there were no takers, perhaps we were too full to appreciate the subtleties… we ordered dessert so that we could keep our big table for a little while longer for our spirited white elephant gift exchange. It’s those salads and noodle dishes and not the dessert that I plan to go back for anyways… It was a festive feast, a lovely spot to celebrate the season with friends. Happy holidays to all! OMG, that is the kind of food I adore! Spicy, exotic and so comforting. That bread looks wonderful. Thanks for the find and all the delicious pictures! I haven’t tried Burmese food before. Hopefully, I’ll get to try it if I’m in the area. Happy Holidays! It’s been years since I’ve been to Mandalay but I agree that it feels more authentic and the food is on par with Burma Superstar. There, I said it! 😉 I actually think the tea salad at Mandalay has a more interesting flavor than at the other place. Gosh, you guys did have a feast! What a feast! I love those kind of dishes with the thick gravy ladled over everything. And what an interesting dessert. It almost looks Persian. Despite living in the Inner Sunset/Lake district for two years, we never made it to Burma Superstart or this restaurant. 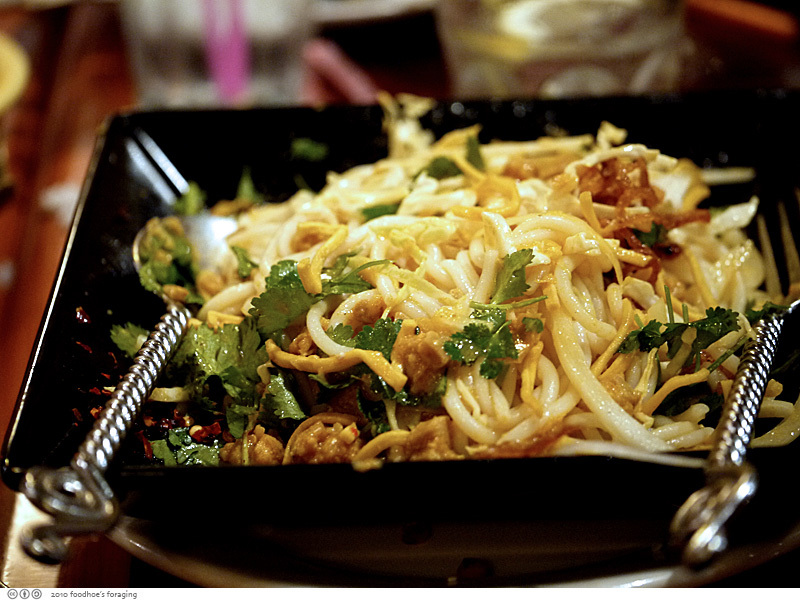 Thanks for these pics … I’ve always wondered what Burmese food looks like! My BF’s favorite restaurant is Mandalay, and he doesn’t even like Asian food that much. He’s moving over here to Oakland, so we’ll just have to drive to the fog once in a while–Burma Superstar is not as good. i can’t get past the samusas–how perfectly crisp! Wow this dish looks awesome, as do all your photos. What a lovely dinner! I have yet to try Burmese food, but from the looks of your meal, I’m pretty certain I’d adore it. Happy holidays to you too! I don’t get to try Burmese food often, but I love it when I do. The food has a good influence from Indian cuisine. Tasty and good stuff! My wife and I were just visiting SF and ordered many of the same things at Mandalay. Your photos are helping us to adjust to being back home. This is the Richmond district not the Sunset. You are correct, I fixed it and thank you very much!